Over 100 buses to go on display at the Buses Festival! Over 100 vintage and modern buses will go on display at the Buses Festival which returns for a fourth year at the British Motor Museum on Sunday 20 August. Organised by Key Publishing, publisher of Buses Magazine, the festival will feature a remarkable display of restored, vintage and modern buses and coaches from up and down the UK. Visitors can also enjoy free heritage bus rides around local routes and the Museum's internal road network. To complement the show a number of indoor and outdoor traders will also be joining the Festival bringing a variety of 'bus' related items for visitors to browse and purchase including books, DVDs, models and more - a perfect place for visitors to shop for a unique gift or for a new addition to an existing collection. Entry to the Museum is included in the ticket price and there are over 400 historic British cars to explore both within the main Museum and the Collections Centre. In addition visitors can wander around the new British Motoring Treasures Exhibition and families can enjoy the new family Treasure Trail and outdoor play area. 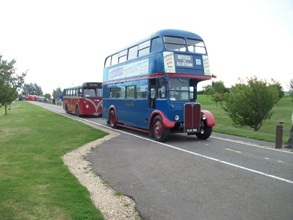 Tom Caren, Show Manager for the British Motor Museum stated "The Buses Festival is a fantastic day out for bus and coach enthusiasts as well as families. The continuing popularity of this Festival has made it one of the best classic and modern bus and coach events of the year". On the day tickets cost £14 for adults, £9 for children (under 5's are free) and £12 for concessions. Discounted tickets are also available in advance online http://www.busesfestival.com. Entry to the Museum is also included in the ticket price. Gift Aid Tickets and other promotional vouchers can be used at this show.